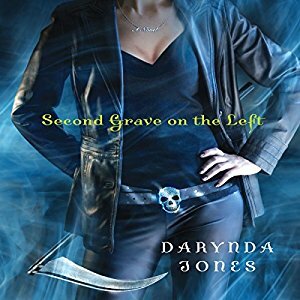 Second Grave on the Left is book two in the Charley Davidson series by Darynda Jones. The humor continues in this second installment of Charley Davidson. It’s over-the-top ridiculous, but so much fun. Expect to laugh out loud. Charley is one unusual character. Her personality, fearlessness, and sauciness just add to the whole thing. Cookie is Charley’s friend, neighbor, and co-worker. She is a great sidekick. She’s got Charley’s back and brings her own humor into the mix. The main plot revolves around one of Cookie’s friends, so she’s taking a more active role in this investigation. I liked seeing more of Cookie and having her around with Charley. I had fun with the different mysteries, yes, their is more then one thing going on. I also cried in some areas. I’m glad I don’t have to wait for the next book release; because the ending left me wanting more asap. The Narrator, Lorelei King, brings Charley and all the characters to life. It’s memorable. Her witty tone and colorful reading add to the listeners enjoyment and bring’s the world and characters to life. I’m so adoring the audiobooks for this series. I have to say Jones and King are a winning combo. I’m savoring the audiobooks for the Charley Davidson series. I recommend giving this series a listen. You certainly will have a good time! Thank you Kathy for stopping in and sharing! Ugh, I wish my library had this series on audible. Thanks for the super review Angela! Sorry your library doesn’t have the audio for this series. That’s the downside with library sometimes… Thank’s for checking out my review! I have read every book in this series and really do enjoy them. The books are bit pricey but I still buy them because I love the story line and where the author has taken the people in the books thus far. I’m not a fan of audio myself but I’m glad to read you are enjoying the books and hope you will continue to read more in the series. I can’t wait for the thirteenth one to come out. King does an amazing job with this series. I’m listening to Twelve right now and she just blows me away with her narration. She can make me laugh or get that lump in my throat (I refuse to cry, if Darynda Jones makes me cry this book, I’m going to throw a temper tantrum!). I’m glad you are enjoying them! I haven’t tried the audio of this series but I love reading them! I bet… I love to read too, but lately I’ve been having more headaches and when they come I can’t read, so audio is the way to go. I’ve been listening to my favorites that I love to read over and over, but I also started this series and just love King’s narration. I’m having fun with the Charley Davidson series. Thank’s Melliane for stopping in.